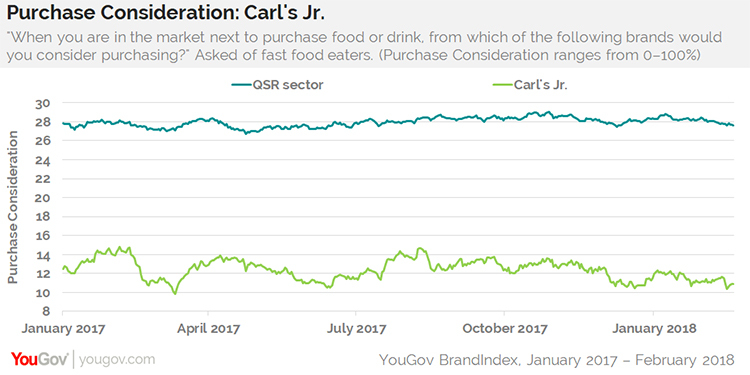 Nearly one year after switching advertising gears from racy to menu-focused, Carl’s Jr. has not improved its position with fast food eaters, according to YouGov BrandIndex. This is likely why parent company CKE Restaurants just split Carl’s Jr. from its fellow Hardee’s chain. Even with actor Matthew McConaughey just recruited for a new series of TV spots, Carl’s Jr. and its new creative agency Havas have their work cut out for them. The chain, slowly expanding nationally from its west coast roots, still falls far behind its competitors in key metrics with fast food eaters who are aware of the brand. This is despite dropping its longtime marketing practice of scantily-dressed women at the end of March 2017 for a more food-focused approach, along with revamped packaging, menus, uniforms, and logo. 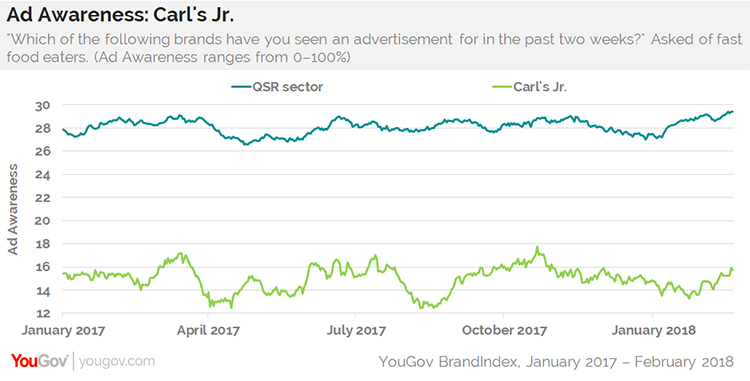 Of particular concern is the seven-month decline of Carl’s Jr.’s measurement of Purchase Consideration with fast food eaters, YouGov BrandIndex’s measurement of potential sales revenue. Last August, 14% of fast food eaters who are aware of the chain said they’d consider buying from them the next time they wanted to eat at a fast food restaurant. That percentage dropped to a current 11%, while the average of the top QSR brands stands at 28%. Ad awareness with fast food eaters has seesawed in small increments since the rebranding debuted nearly one year ago. Its biggest movement coincided with the second execution of the new campaign featuring the fictional “Carl Hardee Sr.” last August, followed in September by a series of ads promoting the box package “$5 All-Star-Meal.” This pushed Ad Awareness up from 13% of fast food eaters recalling a Carl’s Jr. ad to 17% by the end of October. Yet, a 17% Ad Awareness score fell far short of the 29% that the QSR sector average had at the time. 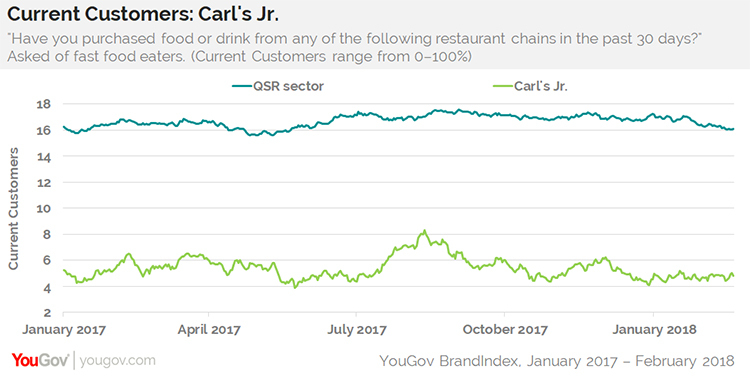 Carl’s Jr. couldn’t even increase its current customers: except for a six-week bump up last summer, the 5% of fast food eaters who said they’ve bought food at Carl’s Jr. in the last 30 days has remained consistently flat.